Where were you on that day? I remember being woken up by a early morning call from my mom urging me to turn on the TV as something was happening in NY City. The events of the day unfolded and I remember being in shock at what took place. It was almost surreal...how could this have happened?! I remember how some politicized it blaming this or that person and sadly people were also asking "Why did God allow this to happen!?" Even today, 11 years later people are asking and as the media replays the tragic events of the day - I still stand convinced that God is still good no matter what people say. There are a lot of people still placing blame and conspiracy theorists adding to the list of "who" was responsible. 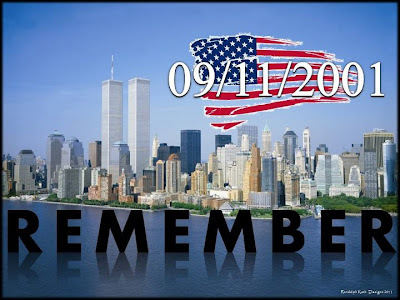 For me I simply choose to pray for those impacted by what happened on 09/11/2001 and I urge you to stand with me in prayer for continued healing and for good, even this many years later, to come from this! God is good and He's still on His throne and He's there for you! If you're struggling today with the events of that day or even the events of today in your life, reach out to The Lord and those close to you as you're not meant to do it alone. Let us never forget those 3,000 people who lost their lives on that day and may be never grow complacent in showing appreciation with our words and actions to those in our family, as well as our friends, church family and those who God has planted around us. I received the following today and on this day of remembrance thought it was fitting to share something to add a little calmness to your day. It reminded me to take a deep breath today and rest in the beauty of His creation which shows His finger prints - His reminders to us that He is there!